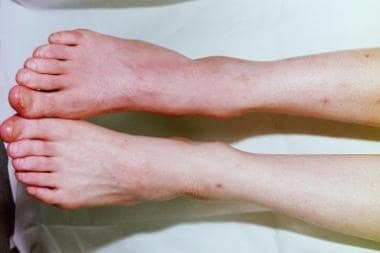 A 29-year-old woman with reflex sympathetic dystrophy in the right foot demonstrates discoloration of the skin and marked allodynia. This photo shows the same patient as in the above image, following a right lumbar sympathetic block. Marked increase in the temperature of the right foot is noted, with more than 50% pain relief. A 68-year-old woman with complex regional pain syndrome type II (causalgia). A 36-year-old woman with right arm reflex sympathetic dystrophy and dystonic posture (movement disorder). In the 17th Century, Ambroise Pare presented the earliest description of RSD as severe burning pain following peripheral nerve injury. Pare, a surgeon, treated King Charles IX for smallpox by inducing bleeding with a lancet applied to the arm. After this treatment, the king suffered from persistent pain, muscle contracture, and inability to flex or extend his arm. In 1864, Mitchell coined the term causalgia, which means burning pain, to describe persistent symptoms following gunshot wounds to peripheral nerves during the American Civil War. In 1900, Sudeck described radiographic spotty osteopenia. In 1916, Leriche focused on the sympathetic nervous system. In 1946, Evans used the term RSD, believing that sympathetic hyperactivity is involved somehow in the abnormal activity in the periphery. In 1993, the International Association for the Study of Pain (IASP) held a Special Consensus Conference addressing diagnosis and terminology (endorsing the term CRPS). 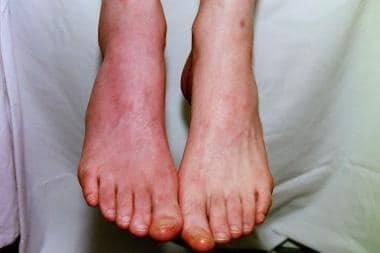 CRPS is a relatively common disabling disorder of unknown pathophysiology. RSD is a variable symptom complex that probably results from multiple causes arising through different pathophysiologic mechanisms. Changes in the peripheral and central somatosensory, autonomic, and motor processing and a pathologic interaction of sympathetic and afferent systems are described as underlying mechanisms. Several hypotheses exist regarding the mechanism of sympathetically mediated pain and describe central and peripheral components. Wasner and colleagues demonstrated a complete functional loss of cutaneous sympathetic vasoconstrictor activity in an early stage of RSD/CRPS I, with recovery. This autonomic dysfunction originates in the central nervous system (CNS). Kurvers and colleagues suggested a spinal component to microcirculatory abnormalities at stage 1 of RSD, which appeared to manifest itself through a neural antidromic mechanism. This spinal component may be evoked by traumatic excitation of a peripheral nerve on the affected side. Baron and Janig have proposed a positive feedback circuit, consisting of primary afferent neuron, spinal cord neurons, sympathetic neurons, and a pathologic sympathetic coupling. The cause of vascular abnormalities is unknown, and debate still surrounds the question of whether the sympathetic nervous system (SNS) is involved in the generation of these changes. The old Sudeck concept of an exaggerated regional inflammatory response is supported by new data indicating that, in patients with acute RSD, immunoglobulin G labeled with indium-111 (111In) is concentrated in the affected extremity. A study with 31P (phosphorus) nuclear magnetic resonance (NMR) spectroscopy showed an impairment of high-energy phosphate metabolism, which explains why these patients are unable, rather than unwilling, to exercise. Electron microscope studies of skeletal muscle biopsies showed reduced mitochondrial enzyme activity, vesiculation of mitochondria, disintegration of myofibrils, abnormal depositions of lipofuscin, swelling of endothelial layers, and thickening of the basal membrane, which are all signs of oxidative stress. Oxygen consumption is reduced in limbs affected by RSD, and reduction of pain following treatment with oral vasodilators has been described. After a partial nerve lesion, excessive antidromic activation of undamaged afferent C fibers and neuropeptide release, leading to acute vasodilation within the innervation territory of the affected nerve, were demonstrated. The frequency of the presence of human lymphocyte antigen-DQ1 (HLA-DQ1) was increased significantly in RSD compared with control frequencies. This association provides an indication of an organic basis. Limited information is available about the epidemiology of CRPS in the United States and internationally. 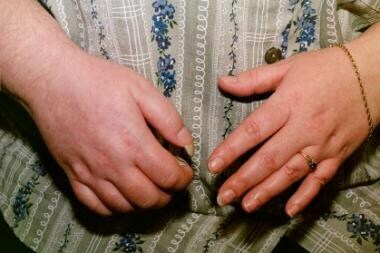 Actual incidence is unknown, as CRPS is often misdiagnosed. Some sources report, the incidence of causalgia (CRPS II) following injury to a peripheral nerve is 1-5%. The incidence of RSD (CRPS I) is 1-2% after various fractures and 2-5% after peripheral nerve injury. RSD has significant morbidity, so raising awareness of this disease is important. According to Murray, earlier recognition and appropriate referral is very important, especially in children. Prompt referral can avoid unnecessary investigations and treatments that may worsen the condition. 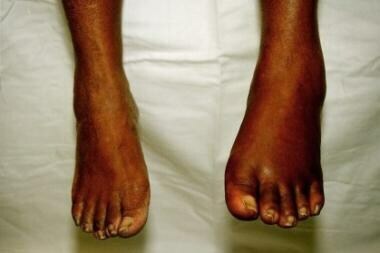 Paice E. Reflex sympathetic dystrophy. BMJ. 1995 Jun 24. 310(6995):1645-8. [Medline]. [Full Text]. Uceyler N, Eberle T, Rolke R, et al. Differential expression patterns of cytokines in complex regional pain syndrome. Pain. Sep 2007. [Medline]. Wasner G, Heckmann K, Maier C, et al. Vascular abnormalities in acute reflex sympathetic dystrophy (CRPS I): complete inhibition of sympathetic nerve activity with recovery. Arch Neurol. 1999 May. 56(5):613-20. [Medline]. [Full Text]. Kurvers HA, Jacobs MJ, Beuk RJ, et al. The spinal component to skin blood flow abnormalities in reflex sympathetic dystrophy. Arch Neurol. 1996 Jan. 53(1):58-65. [Medline]. Blaes F, Tschernatsch M, Braeu ME, Matz O, Schmitz K, Nascimento D. Autoimmunity in complex-regional pain syndrome. Ann N Y Acad Sci. 2007 Jun. 1107:168-73. [Medline]. Veldman PH, Reynen HM, Arntz IE, Goris RJ. Signs and symptoms of reflex sympathetic dystrophy: prospective study of 829 patients. Lancet. 1993 Oct 23. 342(8878):1012-6. [Medline]. Maleki J, LeBel AA, Bennett GJ, et al. Patterns of spread in complex regional pain syndrome, type I (reflex sympathetic dystrophy). Pain. 2000 Dec 1. 88(3):259-66. [Medline]. Peterlin BL, Rosso AL, Nair S, et al. Migraine may be a risk factor for the development of complex regional pain syndrome. Cephalalgia. 2009 Jul 9. [Medline]. Elsharydah A, Loo NH, Minhajuddin A, Kandil ES. Complex regional pain syndrome type 1 predictors - Epidemiological perspective from a national database analysis. J Clin Anesth. 2017 Jun. 39:34-7. [Medline]. Werner R, Davidoff G, Jackson MD, et al. Factors affecting the sensitivity and specificity of the three-phase technetium bone scan in the diagnosis of reflex sympathetic dystrophy syndrome in the upper extremity. J Hand Surg [Am]. 1989 May. 14(3):520-3. [Medline]. Kozin F, Soin JS, Ryan LM, et al. Bone scintigraphy in the reflex sympathetic dystrophy syndrome. Radiology. 1981 Feb. 138(2):437-43. [Medline]. [Full Text]. Schürmann M, Zaspel J, Löhr P, et al. Imaging in early posttraumatic complex regional pain syndrome: a comparison of diagnostic methods. Clin J Pain. 2007 Jun. 23(5):449-57. [Medline]. Bruehl S, Lubenow TR, Nath H, Ivankovich O. Validation of thermography in the diagnosis of reflex sympathetic dystrophy. Clin J Pain. 1996 Dec. 12(4):316-25. [Medline]. Chelimsky TC, Low PA, Naessens JM, et al. Value of autonomic testing in reflex sympathetic dystrophy. Mayo Clin Proc. 1995 Nov. 70(11):1029-40. [Medline]. Brunnekreef JJ, Oosterhof J, Wolff AP, et al. No impaired hemoglobin oxygenation in forearm muscles of patients with chronic CRPS-1. Clin J Pain. 2009 Jul-Aug. 25(6):513-9. [Medline]. [Guideline] Harden RN, Oaklander AL, Burton AW, et al. Complex regional pain syndrome: practical diagnostic and treatment guidelines, 4th edition. Pain Med. 2013 Feb. 14(2):180-229. [Medline]. [Full Text]. Rashiq S, Galer BS. Proximal myofascial dysfunction in complex regional pain syndrome: a retrospective prevalence study. Clin J Pain. 1999 Jun. 15(2):151-3. [Medline]. Steverens VL, Oerlemans HM, Weesels A. Cost effectiveness analysis of adjuring physical or occupational therapy for patients with RSD. Arch Phys Med Rehabilitation. 1999. 80:1038-43. Eckmann MS, Ramamurthy S, Griffin JG. Intravenous regional ketorolac and lidocaine in the treatment of complex regional pain syndrome of the lower extremity: a randomized, double-blinded, crossover study. Clin J Pain. 2011 Mar-Apr. 27(3):203-6. [Medline]. Kumar K, Nath RK, Toth C. Spinal cord stimulation is effective in the management of reflex sympathetic dystrophy. Neurosurgery. 1997 Mar. 40(3):503-8; discussion 508-9. [Medline]. Geurts JW, Smits H, Kemler MA, et al. Spinal cord stimulation for complex regional pain syndrome type I: a prospective cohort study with long-term follow-up. Neuromodulation. 2013 Nov-Dec. 16(6):523-9; discussion 529. [Medline]. van Hilten BJ, van de Beek WJ, Hoff JI, et al. Intrathecal baclofen for the treatment of dystonia in patients with reflex sympathetic dystrophy. N Engl J Med. 2000 Aug 31. 343(9):625-30. [Medline]. [Full Text]. Lundborg C, Dahm P, Nitescu P, et al. Clinical experience using intrathecal (IT) bupivacaine infusion in three patients with complex regional pain syndrome type I (CRPS-I). Acta Anaesthesiol Scand. 1999 Jul. 43(6):667-78. [Medline]. Park J, Lee YJ, Kim ED. Clinical effects of pulsed radiofrequency to the thoracic sympathetic ganglion versus the cervical sympathetic chain in patients with upper-extremity complex regional pain syndrome: a retrospective analysis. Medicine (Baltimore). 2019 Feb. 98 (5):e14282. [Medline]. Dielissen PW, Claassen AT, Veldman PH, Goris RJ. Amputation for reflex sympathetic dystrophy. J Bone Joint Surg Br. 1995 Mar. 77(2):270-3. [Medline]. [Full Text]. Monti DA, Herring CL, Schwartzman RJ, et al. Personality assessment of patients with complex regional pain syndrome type I. Clin J Pain. 1998 Dec. 14(4):295-302. [Medline]. Hassenbusch SJ, Stanton-Hicks M, Schoppa D, et al. Long-term results of peripheral nerve stimulation for reflex sympathetic dystrophy. J Neurosurg. 1996 Mar. 84(3):415-23. [Medline]. Nayak R, Banik RK. Current Innovations in Peripheral Nerve Stimulation. Pain Res Treat. 2018. 2018:9091216. [Medline]. Zollinger PE, Tuinebreijer WE, Breederveld RS, et al. Can vitamin C prevent complex regional pain syndrome in patients with wrist fractures? A randomized, controlled, multicenter dose-response study. J Bone Joint Surg Am. 2007 Jul. 89(7):1424-31. [Medline]. Mbizvo GK, Nolan SJ, Nurmikko TJ, et al. Placebo Responses in Long-Standing Complex Regional Pain Syndrome: A Systematic Review and Meta-Analysis. J Pain. 2015 Feb. 16(2):99-115. [Medline]. [Guideline] Henderson J. Updated guidelines on complex regional pain syndrome in adults✰. J Plast Reconstr Aesthet Surg. 2019 Jan. 72 (1):1-3. [Medline]. [Full Text]. Hsu ES. Practical management of complex regional pain syndrome. Am J Ther. 2009 Mar-Apr. 16(2):147-54. [Medline]. Quang-Cantagrel ND, Wallace MS, Magnuson SK. Opioid substitution to improve the effectiveness of chronic noncancer pain control: a chart review. Anesth Analg. 2000 Apr. 90(4):933-7. [Medline]. [Full Text]. Jain KK. An evaluation of intrathecal ziconotide for the treatment of chronic pain. Expert Opin Investig Drugs. 2000 Oct. 9(10):2403-10. [Medline]. Kiefer RT, Rohr P, Ploppa A, et al. Complete recovery from intractable complex regional pain syndrome, CRPS-type I, following anesthetic ketamine and midazolam. Pain Pract. 2007 Jun. 7(2):147-50. [Medline]. Koffler SP, Hampstead BM, Irani F, et al. The neurocognitive effects of 5 day anesthetic ketamine for the treatment of refractory complex regional pain syndrome. Arch Clin Neuropsychol. 2007 Aug. 22(6):719-29. [Medline]. Brinkers M, Rumpelt P, Lux A, Kretzschmar M, Pfau G. Psychiatric Disorders in Complex Regional Pain Syndrome (CRPS): The Role of the Consultation-Liaison Psychiatrist. Pain Res Manag. 2018. 2018:2894360. [Medline]. [Full Text]. Dumitru D. Reflex sympathetic dystrophy. Phys Med Rehabil: State Art Rev. 1991. 5:89-101. Normal laser Doppler study of the upper extremities. When the patient performs inspiratory gasp repeatedly during laser Doppler image acquisition, the transient capillary flow decreases are displayed easily and dramatically (as dark bands) in the pseudocolor image. Laser Doppler study of the upper extremities in a patient with right hand reflex sympathetic dystrophy. Laser Doppler study of the lower extremities in a 25-year-old woman with reflex sympathetic dystrophy in the right foot. Algorithm for the management of chronic regional pain syndrome (CRPS). Resolution of this syndrome does not commonly occur, and the patient will need chronic pain management.